By Dan Ambrose: It’s been three years since Miguel Cotto (36-2, 29 KO’s) was massacred by Antonio Margarito (38-7, 27 KO’s) in an 11th round TKO loss in July 2008. Cotto took a lot of punishment in that fight, enough to where he looked like one of the walking dead from the AMC television program by the end of the fight. Cotto also took severe beatings in a loss to Manny Pacuiao in 2009, and a questionable 12 round split decision victory over Joshua Clottey also in the same year. Bob Arum, Cotto’s promoter at Top Rank, has been extra careful with Cotto since his last beating against Pacquiao and has matched him ever so lightly since then, setting him up to win the WBA junior middleweight paper title against Yuri Foreman and then matching him against 38-year-old way his best Ricardo Mayorga in his last fight. Cotto has how piled up a nice little two-fighting winning streak as he comes into his December 3rd rematch with Margarito at Madison’s Square Garden. Cotto will have the crowd on his side in this fight, as the huge Puerto Rican fanbase in the New York area will surge into the Madison Square Garden on December 3rd to give him all the support that he needs. However, the fans won’t be out there in the ring taking blows for Cotto, and that’s going to be the problem here. 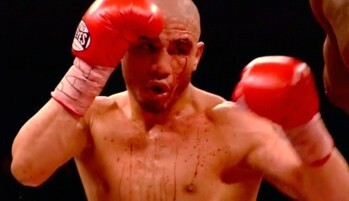 I don’t what it is buy Cotto’s skin seems to swell and bust up incredibly quick when he gets hit, even when he’s running, he still swells with every hit to the head. Margarito has the confidence of someone who knows how to beat Cotto after the demolition of Cotto he did in 2008. That memory will be important for Margarito, because he figured Cotto out by the 10th round and realized what a sucker he was for the uppercut, and nothing has changed since then. Cotto’s still very much vulnerable to an upper cut and will be taking a massive amount of punishment in this fight if he can’t run and hide his head from the big blows from Margarito in this fight. I think it’s going to get ugly once the blood starts flowing down Cotto’s face and it’s going to be like waving a red handkerchief in front of a angry bull because Margarito will really go for Cotto after he’s got him bloody and battered. Cotto will end up taking a knee or getting stopped on the deck if he’s unable to run for the full 12. Personally, I don’t think Cotto can. He’s too much of a wide body to run for 12 rounds, and lacks the sprinter’s physique to keep on the run for long. He actually has to slug it out with Margarito or it’ll be a repeat of the last fight with Cotto taking knees left and right in order to avoid punishment.